Clyde Jones explains how to use 4060 microchips to make LED light effects. Lights make a model look so much more ‘alive’ and ‘real’. But static lights soon become boring. A model with changing lighting - whether strobes, blinkers, or just slowly changing patterns is even more interesting. But, how to make the lighting long lasting, economical of power, and simple? Light bulbs burn out. Often. And usually just when you are in need of their reliable performance at a model contest, or when showing your latest creation to an admiring someone. I’m not fond of light bulbs. Little glass envelopes containing a spiral of tungsten wire heated to white heat by electricity. They get hot, they use lots of electricity, and they die easily. Especially if they’re blinking. The constant on/off/on/off stresses the delicate filament which produces the light shortening the life of the bulb remarkably. LEDs are inherently long lived devices. I have a few displays that have been constantly active for over a quarter of a century. That’s blinking, powered by ‘wall warts’ or small transformers that plug into a wall outlet, constantly. Pretty good longevity for any light source. And if you blink them, they last LONGER because they’re off part of the time and ‘resting’. Incandescent light bulbs waste power, producing a little light and a lot of heat. Batteries don’t last too long powering bulbs. The heat can melt models. If you want blue light from a bulb, you have to filter out all the other colors the bulb is producing wasting still more of the power. LEDs run cool, no waste heat, and use perhaps 10% of the power of a bulb to produce the same amount of light, at the worst. If you need blue light, you use a blue LED - essentially a crystal that produces only blue light when stimulated by an electric current. No power is wasted producing light that you just throw away by filtering. White LEDs produce - surprise! - white light which CAN be filtered if you need to for some reason, but it’s a lot more power efficient to just use LEDs that are made to produce the color of light you want. BUT, remember that trying to filter a Green LED to produce Red light won’t work - the Green LED produces ONLY Green light - and filters only remove colors, they can’t create them. Light bulbs are fairly simple to use - but difficult to replace if they burn out. Also, controlling them takes a bit more circuitry then LEDs require because the bulbs require more power, therefore more parts. LEDs have a few simple rules to remember. Once you get the hang of these simple rules, LEDs are relatively easy to use. If you don’t abuse them by over driving them - giving them too much current - or by physically mangling the critical internal bits they should last almost a lifetime. One. LEDs are polarized. Like batteries, they have a + and a - connection. As long as you connect the + from your battery or power source to the + of the LED and the - to the -, the LED should light. If not, you probably have the LED connected backwards. LEDs that are connected backward do not light. This is a blessing and a curse. It’s a blessing because we can use that ‘one way’ capability to do wonderful things in lighting. It’s a curse because if you are not careful and connect some LEDs backward to others they will not all light at the same time. This can be - upsetting - if they have already been built into a model. Two. They need a certain MINIMUM amount of VOLTAGE to light. An LED built to operate on 2.4 volts will light quite happily on anything from 3 volts (two penlight batteries) upwards to 9 volts. An LED built to operate on 3.6 volts will not light on 3 volts but will work on 4.5 volts (3 penlight batteries) upwards. LEDs ‘eat’ voltage. If you have 9 volts available, you can put several LEDs in SERIES like cars in a train, and they will all light. IF. If the total voltage needed to run them all is less than 9 volts. For instance, you can use a Blue LED (3.6 volts) and a SuperBrite Red LED (2.4 volts) in series quite nicely. 3.6 + 2.4 + 6 volts leaving 3 volts to either drive another LED using LESS than 3 volts, or to be ‘dropped’ or eaten by a ‘dropping’ resistor. That’s assuming you are driving them directly from a battery - the chips I like to use limit the power available. Three. They need a certain amount of AMPERAGE to operate, but too much will cause them to emit smoke and die. The CURRENT flowing through the LEDs must be limited to a maximum of (usually) .020 AMP or 20 milli-Amps. 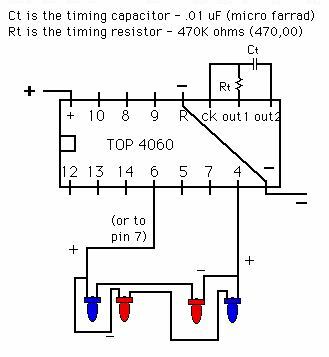 You can do this by either supplying JUST the voltage the LED needs (3.6 volts for a 3.6 volt LED for instance), OR by using a ‘dropping resistor’ to limit the current. OR by driving the LEDs with something that inherently limits the current to safe levels. If you are a modeler interested in making your creations ‘lively’ with blinking lights - marker lights, head or tail lights, strobes - this is a nice little chip that will do a lot of LED blinking for a very little money, power, or complexity. The 4060 chip is a CMOS type, meaning that it uses very very little power internally to run itself. Some chips like the 555 flasher chip use 80 mA to flash a 20 mA LED - 4 times the power needed for the LED just to run the 555 itself. The 4060 uses so little it’s almost meaningless in practical use. The one drawback to the CMOS family of chips is that they are ‘static sensitive’ meaning that they can be destroyed by the little static spark that jumps between your finger and the screw on the light switch in winter. That 1/8” spark represents about 16,000 volts. In practice, I don’t think I’ve ever ‘blown’ a CMOS chip with static electricity - but I’m careful in winter when the air is very dry, and am of a large static-dissipating build. If you are the skinny type person prone to getting shocked by sparks in winter, you might want to work on a piece of aluminum foil, or a static discharge mat, wired to a good ground (the screw holding the cover plate on an outlet, a water pipe) through a 1 meg ohm resistor (for safety). Touching the foil or mat FIRST will drain off any static charge. The 4060 costs about half a buck American - $0.49 US. Cheap. I buy them by the ‘stick’ or static-proof carrier tube of 25 at a time. Even cheaper that way. 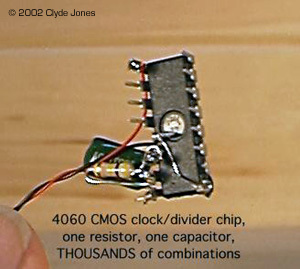 The 4060 uses only two external parts to begin ‘blinking’ or ‘clocking’ or ‘working’. One is a resistor - usually a 470,000 ohm or 470 Kilo-ohm resistor. The other is a .01 uF or .01 micro-Farad capacitor. The resistor costs $0.02 in quantity, and the cap is $0.20 in small quantities. Again, cheap. BEFORE we start to build, let’s talk about connecting things to the chip. Connecting wires to any chip or LED or other small component is best done with a gadget called a ‘wire wrap tool’. Grab a cheap Wire Wrapping tool, like this one from the OK company. Notice the two tubes coming out of opposite ends of the larger central handle. One end WRAPS, the other end UNWRAPS. In the middle is a little strip of metal with a slot and hole in it. That’s the wire stripper. Neat, huh? Which end wraps? The one with TWO holes (usually the longer end). The OUTER hole takes the stripped wire you are going to wrap. The CENTER hole goes over the leg or lead to be wrapped ONTO. Wire wrapping wire comes on little reels holding 50 feet of wire. You can get the wire with different colors of insulation which is a handy way to keep your polarities straight. I use RED wire for POSITIVE connections, BLUE or BLACK for NEGATIVE, and WHITE for SIGNAL or CLOCK pulses. So, how do you do this ‘wire wrapping’ trick? Take a roll of wire, and stick the loose end through the wire stripper in the center of the wrapping gadget. Let about one inch stick past the little strip of metal. Then slide the wire to the narrow end of the slot. That cuts into the insulation. Now, leaving the insulation hung up on the small end of the stripper, pull the wire out. That should leave the insulation on the other side of the stripper and give you a nice stripped length of wire. The stripper works when inserting the wire from either side. If you insert the wire from the side of the handle opposite the strip of metal the body of the handle keeps the strip from flexing too much which may or may not be significant. Insert your freshly stripped length of wire into the OUTER hole of the two at the WRAPPING end of the tool. You should see most of it laying in a thin channel cut into the outer surface of the end piece. Bend the insulated part of the wire sticking out of the tool gently to one side at a 90 degree angle. Put the central hole of the tool (with the wire still in place) over the LED lead or whatever you want to wrap onto. Press your hands GENTLY together and TWIRL the tool as if you were running a screw into a nut. The tool will rotate and WRAP the wire around whatever is in the central hole. The GENTLE pressure will make sure the wrap is tight ENOUGH. Wrapping onto the square or rectangular wire of LEDs or IC legs makes a good solid joint; the edges of the lead cuts into the surface of the wrapping wire.Wrapping onto the round wire of resistors gives a slightly looser joint that may need soldering. Remove wrapping tool from assembly. You can also gently solder the joint later to make it permanent and insure that the joint will not come apart. If you are going to solder the joint, leave any excess length of wire lead until afterward to act as a heat sink to avoid heat damage to the LED or whatever. If you aren’t, you can nip off the excess lead length. If you don’t solder things, you can easily use the UNwrapping end of the tool to unravel and remove the wrapped wire by putting that end over the target joint and twirling the other way. Handy. Now you can decide how much wire you need to get to the next part, add an inch for wrapping the next connection, and cut to length with a small wire cutter. Then strip the other end of the piece of wire and repeat the process. Wire Wrapping makes life much simpler for people who are trying to put electronics into models. How do we hook up this digital wonder? Look at the diagram at left. This is the top view of the 4060. There is a notch on one end of the chip. This indicates where we begin counting pins, so we start wiring the thing right way up. The NOTCH should be on the LEFT when you are looking at the TOP of the 4060. TAKE a spool of RED wire. Strip 1” off the end. WRAP it onto the pin on the UPPER LEFT corner, marked (+) on the chip. This is the POSITIVE connection. TAKE a spool of BLACK wire. Strip 2” off the end. (Yes, two inches.) WRAP a fair bit of wire onto the LOWER RIGHT pin marked (-), then move the end of the tool onto the pin on the TOP ROW also marked (-) and finish wrapping onto that pin. Make sure that the extra length of wire doesn’t contact any other pins. This is both the NEGATIVE connection for the chip, and a method of ‘locking out’ the ‘reset’ connection. It’s also handy to easily note that the red wire goes to the + connection so you don’t get confused about which pins you are working on. REMEMBER, notch to the LEFT, + and RED wire to upper left corner. NOW to add the two little parts that make it ‘clock’ or ‘go blink’. LOOK at the top row of pins. The third from the right is marked “CK” or “Clock”. BOTH the resistor and capacitor go to this pin. It’s a bit of a tight fit, but not hard to make. If you wish, you can use wire wrap to connect this pin to one leg each of the resistor and the capacitor. Or you can use very fine tip needle nose pliers and carefully fold a wire from the resistor and the capacitor around this pin, and then solder. Gently straightening out the pin away from the body of the chip may make this step easier. As usual make sure these wires don’t touch any other pins. NOW, connect the other wire from the resistor to the pin marked “out 1”, the second from the right. NEXT connect the other wire from the capacitor to “out 2” which is the right most pin on the top row. Sometimes I just use the wire wrap to connect the resistor and capacitor, especially if I have to cram the circuit into some place tight. 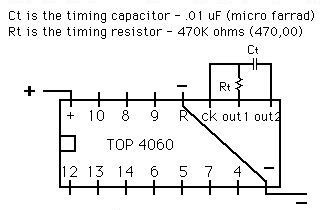 OR I use wire wrapping if I replace the resistor with a half megohm (500,000 ohm) or 1 megohm (1,000,000 ohm) VARIABLE RESISTOR to change the speed of the chip. O.K. That’s it. If you connect a 9 volt battery to the proper power leads, the chip should begin to function. But how do you tell if it’s “alive” and functioning? Take an LED. Virtually any working LED. Touch the pins marked “4” and “6”. (Or any numbered pin and ground (-) or positive (+). You may have to reverse the LED if its polarity doesn’t match the polarity of the (+) or (-) you are touching it too: 4 & 6 are best.). The LED should blink. If it doesn’t, check the wiring again, check to make sure you have a ‘good’ LED, and a well fed 9 volt battery. The 4060 WILL NOT ‘clock’ or blink if fed with LESS THAN 6 volts. ALSO, I’ve been informed that 4060 chips made by Texas Instruments (TI) don’t like 9 volts - use Motorola or Fairchild parts, or virtually anybody’s BUT TI. How fast will things blink? The pin marked “4” is the fastest blinker - changes quicker, more often. The pin marked “14” changes slowest, least often. Each number pin changes half as fast as the smaller numbered pin “below” it in the sequence. Each numbered pin changes twice as fast as the larger numbered pin ‘above’ it in the sequence. AND each pin goes from ‘positive’ to ‘negative’ rather than from ‘on’ to ‘off’. So if you connect a polarized LED between pins, the LED will light IF and ONLY IF the pin connected to its positive lead is positive and the pin connected to its negative lead is in fact negative. 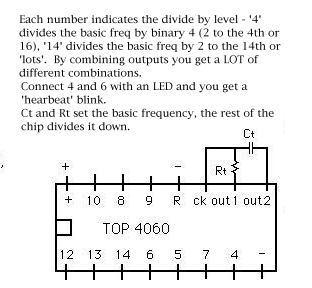 Connecting a normal LED between pins “4” and “6” should give you a ‘heart beat’ blink. Flash Flash, pause, Flash Flash. Experiment. Use a bi-color bi-directional LED for some ‘interesting’ effects. The 4060 can drive one LED per pin out. At the very least. I’ve used 3x 4060’s to drive almost 80 LEDs in over one half billion valid and discrete combinations. Heck of a Tri-corder display. Another article covers the construction of a ‘Chicago PD Power Armor suit’ featuring strobe lights on the ‘helmet’ and a green glowing LED in the ‘eye camera’. This is a very power conservative design, because the LEDs are OFF most of the time. It doesn’t seem like it, but they are. The strobes are two identical sets of (one) RED and (one) BLUE LED in SERIES. BUT, the POSITIVE lead of one set is tied to the NEGATIVE lead of the other, and the same at the other end. So ONLY one set can light at one time, but we can light EITHER SET or NO SET depending on what PLUS or MINUS voltages we apply to each of the legs. You see the TWO sets of LEDs in the illustration to the right. Notice the polarities marked at each end. NOW look at the overall curcuit diagram below and notice that the PLUS of one set is connected to the MINUS of the other. And that each end of the joined sets is connected to two particular pins on the 4060. While pin (6) is PLUS, the pin (4) will change 4 times FROM PLUS to MINUS. And one set of LEDs will light ONLY when pin (4) is MINUS. So the string flashes 2 times. Then pin (6) changes to MINUS and the other string of LEDs will flash 2 times, when pin (4) is PLUS. Connect the strings to pin (7) and each string will flash 4 times before the next string flashes 4 times. It’s not hard to wire up the RED and BLUE LED sets. You just have to be careful. And first build a simple “CHEAP LED TESTER”. Take a connector for a 9 volt batter, solder a 470 ohm resistor (NOT 470K) to the RED or POSITIVE lead, and you have a cheap tester. The resistor limits current flow in the LED under test to 20 mA so it won’t burn out. For safety (of the LEDs) you might want to cover the bit of wire on the resistor that connects to the RED wire with tape or ‘shrink tubing’ to prevent the LED from contacting both the BLACK (negative) wire and the RED (positive) wire without the resistor in between to protect the LED. Most LEDs have one long lead and one short one. The short one is USUALLY the negative one. Usually. Just when you begin to rely on that polarity marking, you will find an LED where the lengths are reversed. That’s why we test each set of LEDs to make SURE which lead is POSITIVE and which is NEGATIVE. Take a BLUE LED and try and make it light by touching the end of the BLACK wire to one lead and the FREE END of the RESISTOR to the other. If it doesn’t light, reverse the connections to the LED. When it does light, notice which lead of the LED is connected to the BLACK (negative) wire, and bend the tip of the wire into an L shape - just the very tip so you know which is the negative lead. Do the same with the other LEDs. The BLUE LEDs and the RED LEDs should have the same (usually shorter) lead bent. TEST again. NOW, wrap a 5 inch length of RED wire wrap wire around the POSITIVE lead of EACH LED - the one that ISN’T BENT. (You bent the tip of the lead so the wire wrap tool can’t go over it even if you try. Safety precaution.) Wrap the wire near the plastic bubble of the LED. Solder. Trim off the excess lead length from those POSITIVE leads. Now, all you have left is the NEGATIVE legs, without any wire on them. Either straighten out the NEGATIVE leads, or nip off the bent end so you can wrap to them. Take the RED (positive) wire from ONE RED LED and wrap it to the NEGATIVE lead of ONE BLUE LED. This gives you a SERIES string of TWO LEDs, hopefully in proper polarity. TEST the string. BOTH should light when you connect the BLACK lead from the tester to the free lead on the RED LED and the RED (positive) wire from the BLUE LED. If not, check each LED independently, and then together to see where the polarities don’t match. Now wrap a 5 inch length of BLACK wire wrap wire to the free lead of the RED LED. You now have one set of strobe lights. Treat the other LEDs the same way. Test. If O.K. Solder all the BLACK wires in place and nip off the excess length of the negative LED leads. You now have two complete sets of RED and BLUE LEDs. EACH string contains TWO different LEDs consuming different amounts of voltage. BUT since each string is identical the power drain of each will be identical. That’s not critical for this circuit, but handy in others. 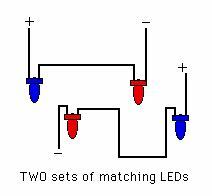 Two series strings of LEDs with different total voltage requirements may not light equally if you are trying to get them to light together. Now, take the BLACK (negative) lead from one set of LEDs and the RED (positive) lead from the other set of LEDs and wrap them BOTH onto pin (4) of the 4060. Take the RED (positive) lead from the first set and the BLACK (negative) lead from the second set and connect them BOTH to either pin (6) or pin (7) of the 4060. Apply power to the 4060. If it was working before, it should begin double strobing or quad strobing first one set of RED/BLUE LEDs, then the other. The GREEN LED is connected to pin (8) and pin (9) so it is on 25% of the time. As you can deduce, the 4060 can flash a LOT of LEDs a LOT of different ways. Just do NOT try and connect one LED from one pin to POSITIVE (+) and another LED from THE SAME PIN to NEGATIVE or GROUND (-) at the same time. Power will just flow from POSITIVE to GROUND ignoring the state of the pin ( + or -) and probably burn out the LEDs almost instantly. Get a few 4060’s. A few resistors and some capacitors. A wire wrap tool and some wire. Borrow or buy a cheap soldering iron and a little solder. Play with the circuit. Poke at some LEDs. Enjoy. This page copyright © 2002 Starship Modeler. Last updated on 26 February 2002.